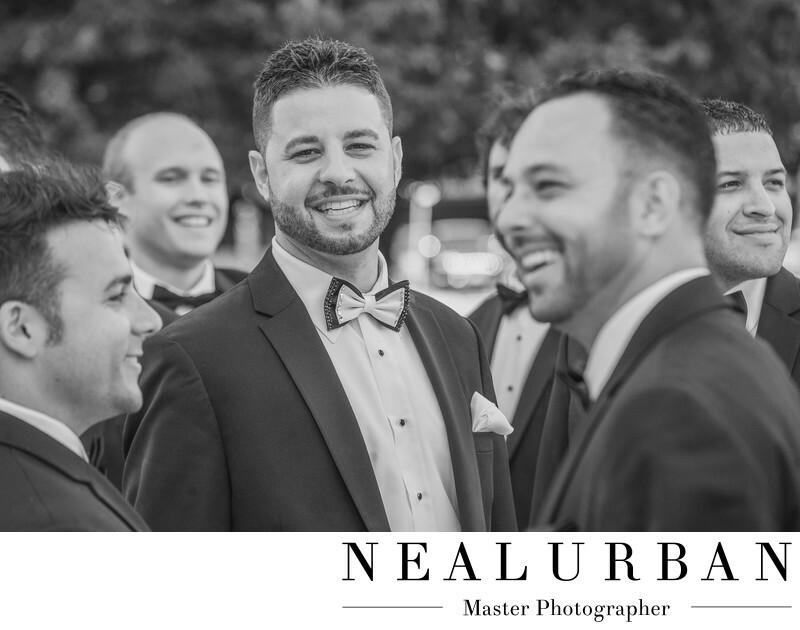 We love this image of Artie and his groomsmen! This was done outside of Our Lady of Victory Basilica. That is where Jenna and Artie had their ceremony. Both the bride and groom wanted to stay at the church for as long as possible for photos. It is gorgeous inside and out. It rivals the churches in Italy! We wanted to have some fun with the wedding party too! One of Neal's ideas for the guys was this image! He wanted Artie surrounded by his boys! It is really cool how Artie is in focus and the guys are out. But you can still see their facial expression. The groomsman in the front is my favorite. He could not stop laughing. We don't even know why he was laughing. But he made the groom react as well. We got an amazing smile from Artie! The guys are not always big fans of photo time! We try our best to make it fun and exciting! We want the guys to feel cool and manly! Sometimes they moan and groan because they just want to drink, but once we show them an image on the camera, they realize how good they look! From here, we went to Niagara Square and City Hall for more photos. Then to the reception at the Statler in Buffalo.